It is unused with a stain on the upper left corner, otherwise it is in excellent condition. 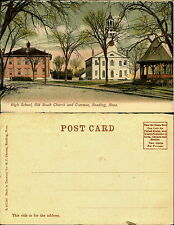 Chrome Postcard Great Masterpiece Lake Wales Florida - da Vinci's "Last Supper"
Light stains, bends and wear. See photos for condition. Stains, bends and wear. See photos for condition. Light stains, bends and wear. See photos for condition. Notice slight imperfections in top left corner. FOTORELICS is only on the scan, not on the card. LOCATION :NEW LONDON, CONNECTICUT. OVER 30 cards[31-60]=. 7.50[ Priority Flat Rate Box ]. 21-30 CARDS=. 4.50 [Parcel]. 16-20 CARDS=. 3.95 [Parcel]. 9-15 CARDS. 3.25 [Parcel]. LOCATION :NEW HAVEN, CONNECTICUT. DATE OF CARD. [Exact date is noted if it appears on the card]. 21-30 CARDS=. 4.50 [Parcel]. 16-20 CARDS=. 3.95 [Parcel]. 9-15 CARDS. 3.25 [Parcel]. LOCATION :NORWICH, CONNECTICUT. OVER 30 cards[31-60]=. 7.50[ Priority Flat Rate Box ]. 21-30 CARDS=. 4.50 [Parcel]. 16-20 CARDS=. 3.95 [Parcel]. 9-15 CARDS. 3.25 [Parcel]. LOCATION :NEW LONDON, CONNECTICUT. [Exact date is noted if it appears on the card]. 9-15 CARDS. 3.25 [Parcel]. 3-8 CARDS=. . 95 [Letter]. DATE OF CARD.